Corporate Helicopters has been the provider of choice for aerial support services for the NORRA Mexican 1000 Rally, a 5 day international off road motorsports event. We have utilized their services for both emergency evacuation plans and enhanced media relations (photography and videography). Always reliable and efficient, their world-class service and top-notch equipment enables us to put total confidence in their capabilities, reduce costs and streamline logistics. Between Ivor, Mandy and their pilots, you won’t find a nicer team to work with. I just wanted to thank you for your help in Baja! Our fathers had a blast and your pilots were very professional! We hired your company this past week for the Baja 500. Outstanding job! In particular, Marshall Jordan, did a great job piloting. He has great situational awareness and kept us all safe! We appreciate professionals! Skydiving Innovations has relied on Corporate helicopters for jump aircraft for nearly 25 years. Without a doubt, Corporate Helicopters is the finest helicopter company we have ever had the pleasure to work with. Everyone, from the pilots to the office staff and ownership make dealing with Corporate Helicopters a positive and fun experience. They share our attitude about safety and professionalism, and, like us, have a perfect safety record. 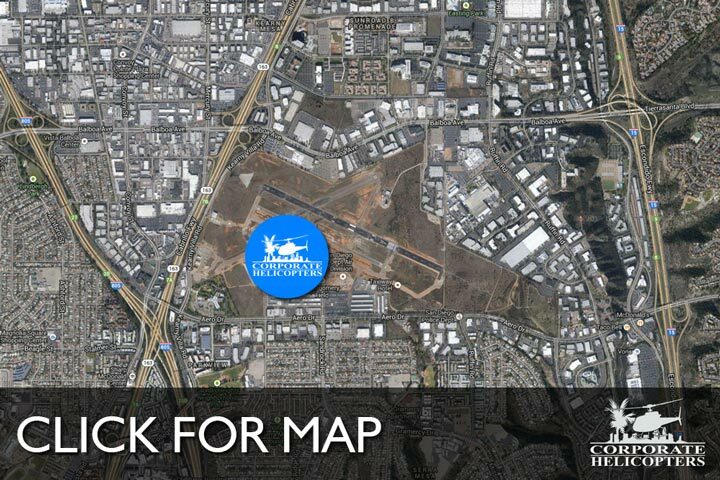 Whether we are jumping in to a stadium, private party or on to the USS Midway, Corporate Helicopters’ pilots are experienced, know what we want, and always, always get us to our jump sites on time! My experience from initial enrollment to completion of FAR Part 141 Private Pilot Helicopter Course, Robinson R-22 Beta 2, with Corporate Helicopters has been nothing short of absolute excellence. The atmosphere and environment provided by the staff and CFI’s consistently maintained the utmost level of professionalism, always keeping safety a top priority. Lessons were concise and well integrated into the current publications for Helicopter/Rotorcraft Aviation. Corporate Helicopters provided me with a knowledge base and pilot skillset that when carried into my FAA Check Ride, my FAA Examiner (Robinson Helicopters Chief Test Pilot!) was inclined to comment that my Oral Exam was excellent, that I was in fact very well prepared, further stating that my Practical Test was of Commercial Pilot quality. He then complemented my CFI Bryan Pederson as well as Corporate Helicopters for producing an excellent addition to the General Aviation community. Bryan accompanied me to the Check Ride and while initially nervous of my CFI being present it was a confidence building experience, many of which Bryan has provided throughout my training. 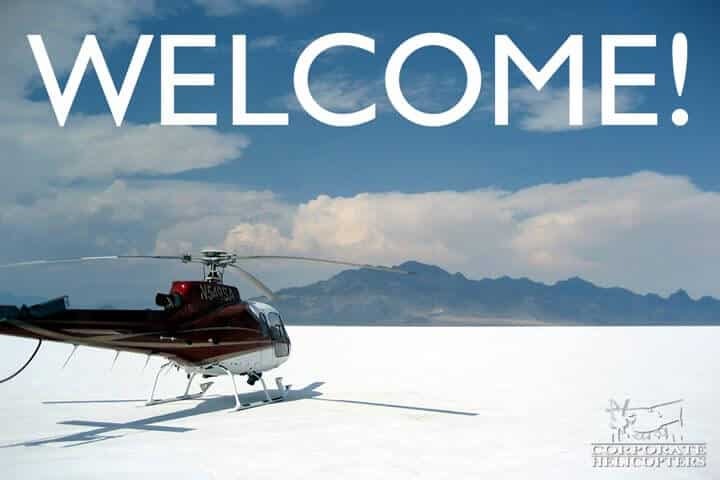 I highly recommend Corporate Helicopters for anyone seeking Flight Instruction. Ken Meme, CP, RPP, President and COO, Towill, Inc. It was a beautiful day to fly! We thank you for your efforts in making our event soar! Thank you and your staff for taking such good care of our client as you landed them on the Midway… Everyone was pleased with the ride and the thrill! Thank you for the great service…..It was a pleasure working with your company. What an awesome trip and experience today! It was beautiful day and an amazing trip for the spouses. The helicopters and pilots did great and I really appreciate all your help and work. They were really blown away with this. Thank you for all of the hard work! Thanks again for all of your guidance beyond just setting up the fuel drops for us. Iram and everyone he brought to the shoot were just terrific! Not a weak link to be found. Thanks for everything on our shoot, the experience was amazing! I was smiling for the entire flight, so much so that my face hurt… I was hooked immediately. I set out to earn my helicopter rating. I want to send my sincerest thanks and gratitude to Ivor Shier, Garner Sheperd, and the Corporate Helicopters team. Their dedication and efforts, as well as their encouragement, helped me to fulfill my dream of flying helicopters! I will always cherish the time I spent as a student at Corporate Helicopters, and would highly recommend them to anyone seeking an environment of professionalism, encouragement and dedication to achieving their goal of becoming a Commercial Helicopter Pilot. I am thoroughly enjoying my first position as a pilot here at Helicopter Adventures in Myrtle Beach, SC. I hope that I will see everyone at Corporate again some time, and wish all of you success!